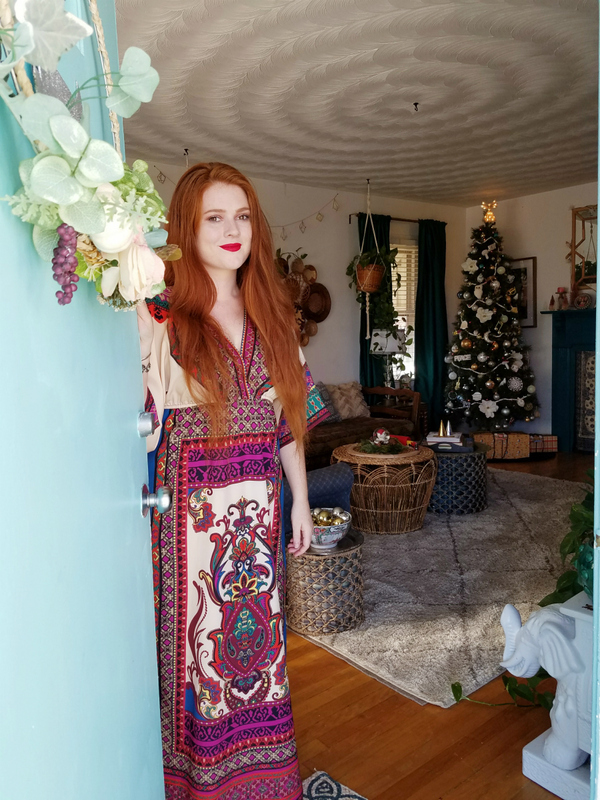 Greetings and welcome to my Winter Eclectic Home Tour. 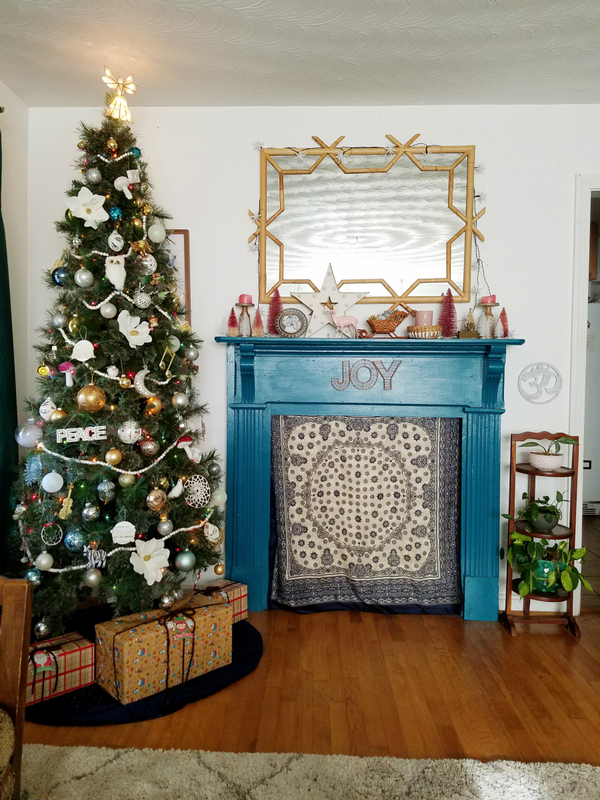 Our halls are decked as much as our little abode and budget can handle and we are ready to enjoy company, hot cocoa, board games, Christmas movies and late nights wrapping presents. It's truly the most wonderful time of this year and I am excited to enjoy it. 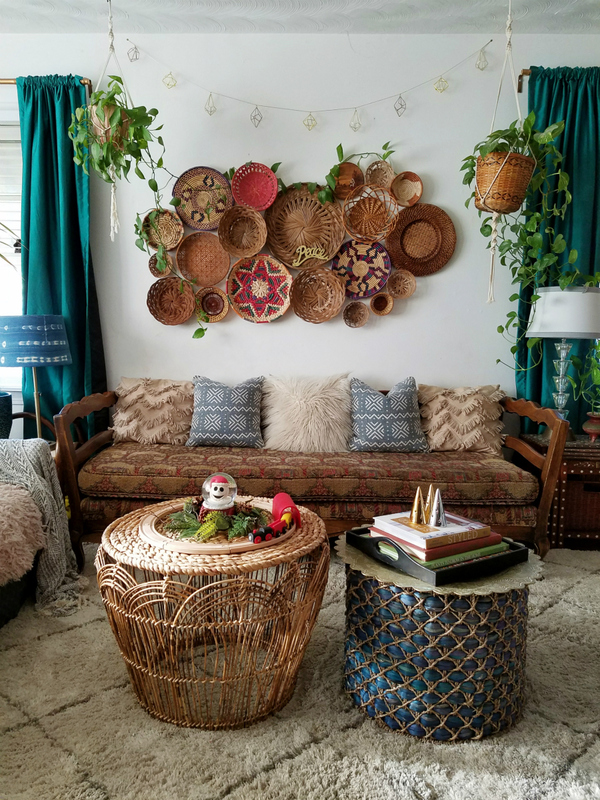 If you are new here, my name is Corinna and this is my boho abode. 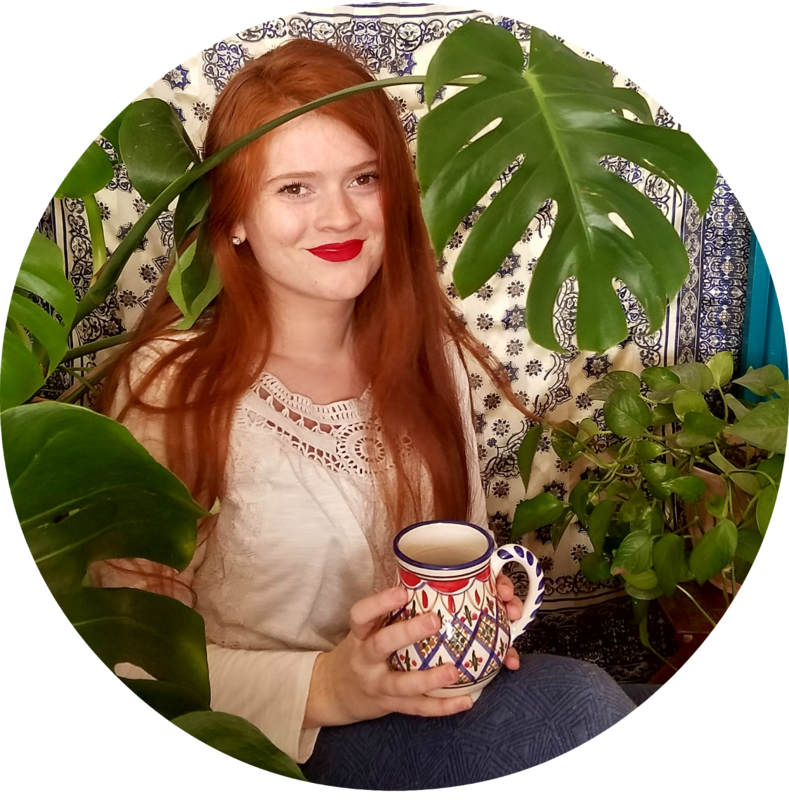 I share my home with my husband, child, a dog, cat, fish, 4 frogs and a few dust bunnies. 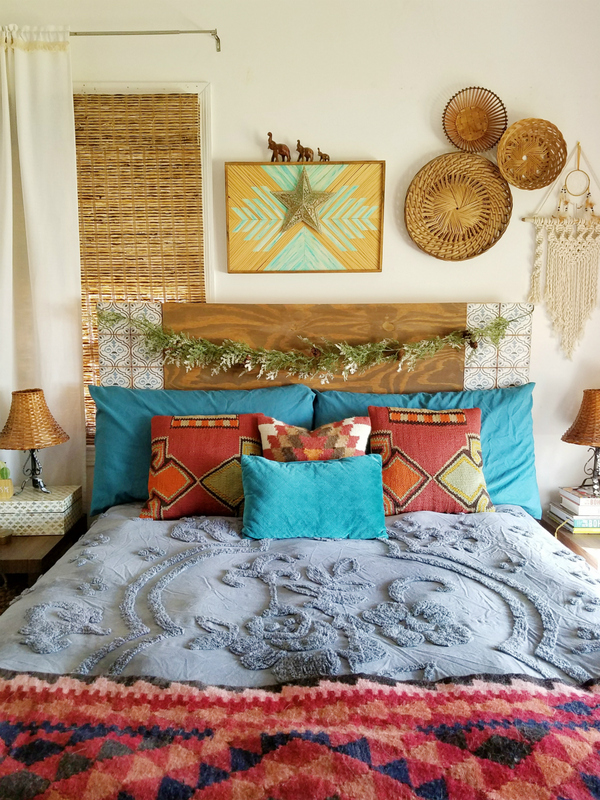 My style is best summed up as "boho" but really it's just a modpodge of things I love. And I love color, texture, plants, comfort, and whimsy. 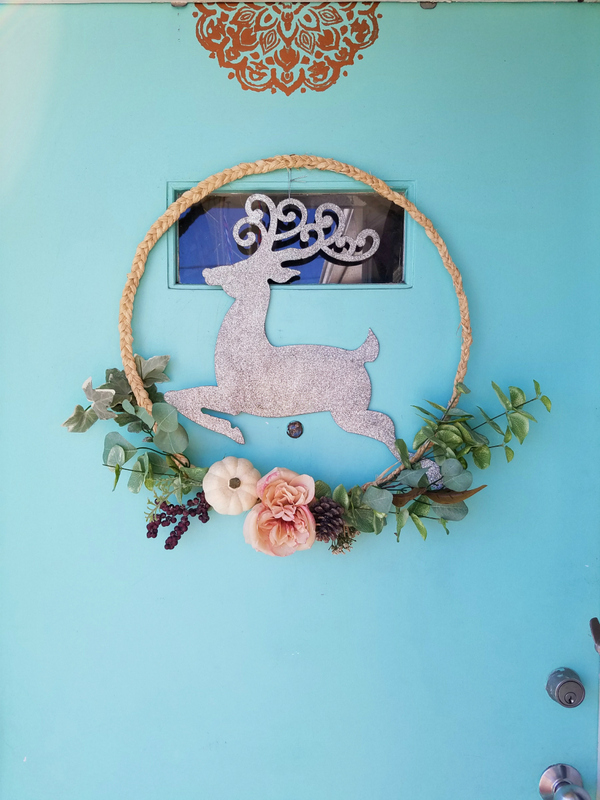 Thank you for joining us for Domicile 37's Winter Eclectic Home Tours. 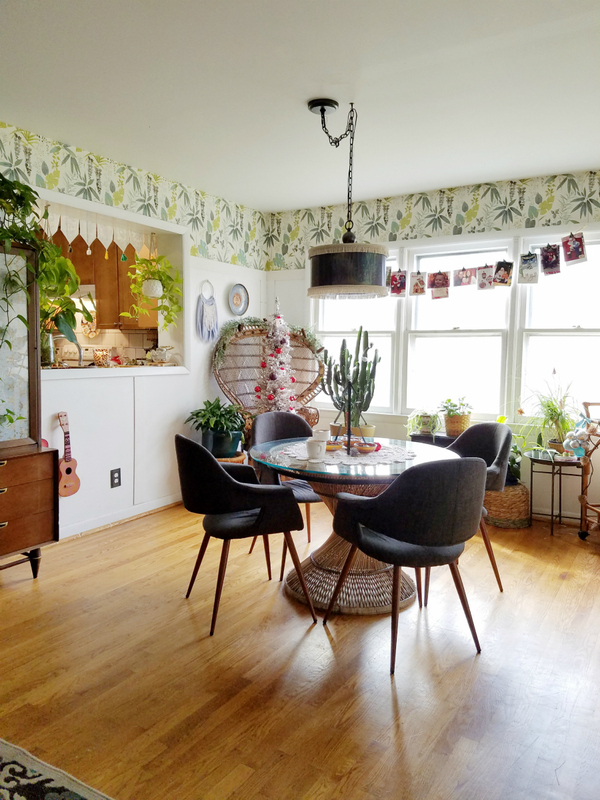 Stay tuned through the end of this post to find links to all of the home tours. My home opens directly into the living room space. So I think it makes best sense to start the tour here. The whole home is 1,300 square feet so things are on the smaller side here. 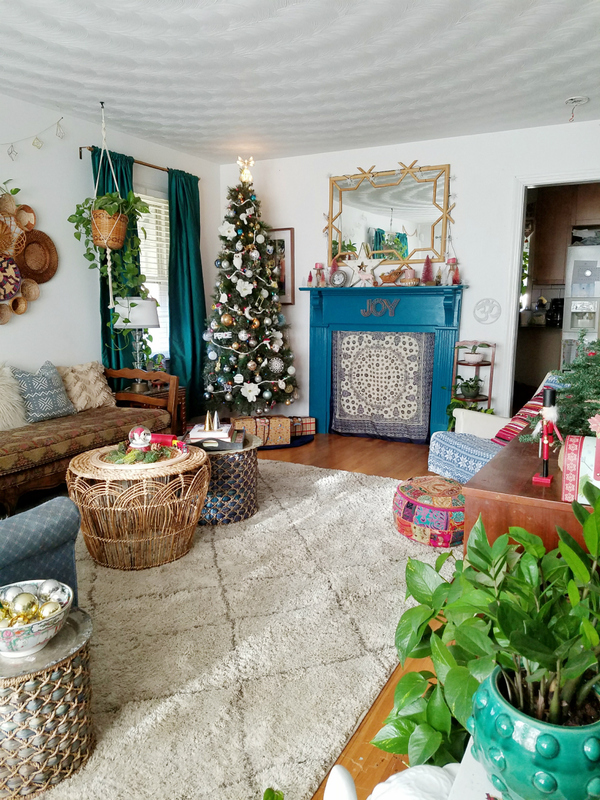 I've put the main tree in this room and have my fireplace mantel in this room. There are a few unique touches to the space that I think you'll enjoy. 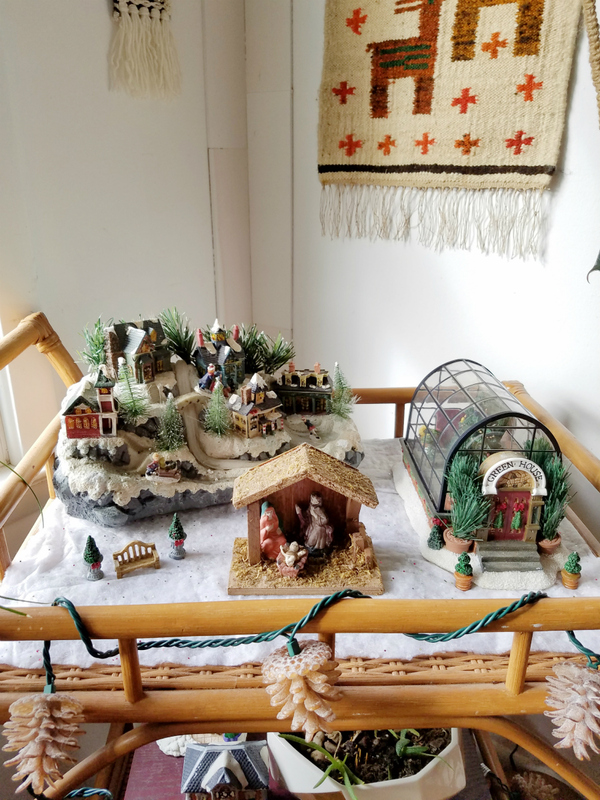 This year I have pulled out all of my usual decor (with the addition of a couple new pieces) so if you've been here in previous years, you may recognize some of the pieces but nearly all of it is displayed differently than where it was before. I actually started to get confused when putting together my Posts Of Christmas Past post because I kept forgetting where things were after looking at all those old images! 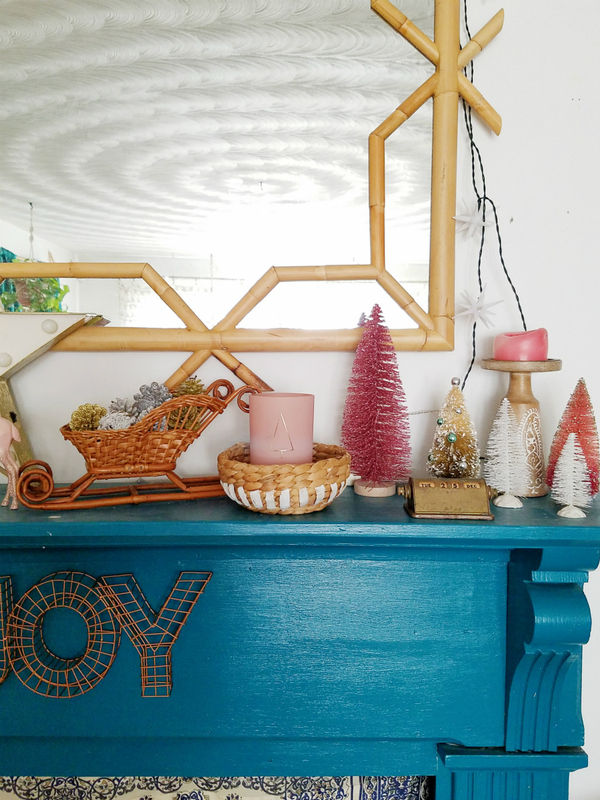 The "fireplace" is still teal blue and I've paired it with a pink bottle brush forest, a giant marquee star, a thrifted wicker sleigh headed up by a pink deer a friend gifted to me, pink candles, and I stuck the wire JOY sign on the face of the mantel. The candle in the jar was gifted to me by Brookyln Candle Studio and it's cypress scented. 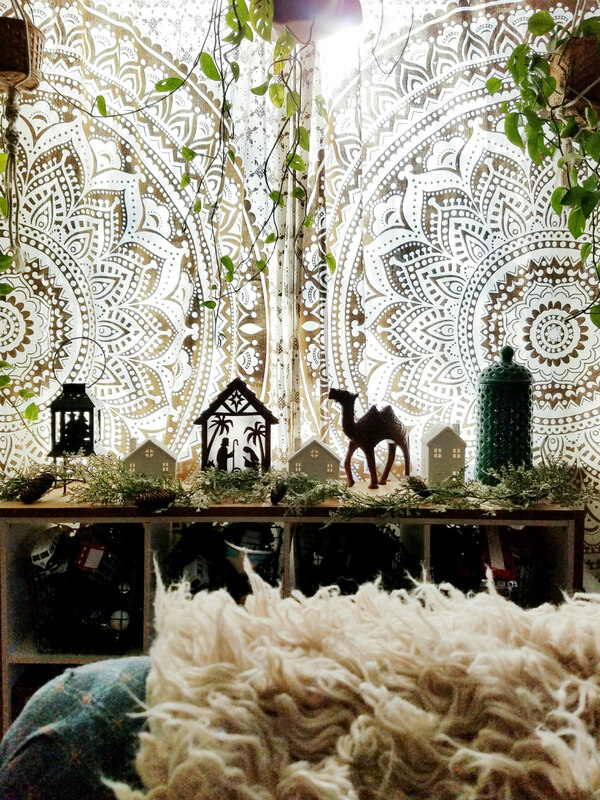 It couldn't be more perfect for the theme of the decor right now! 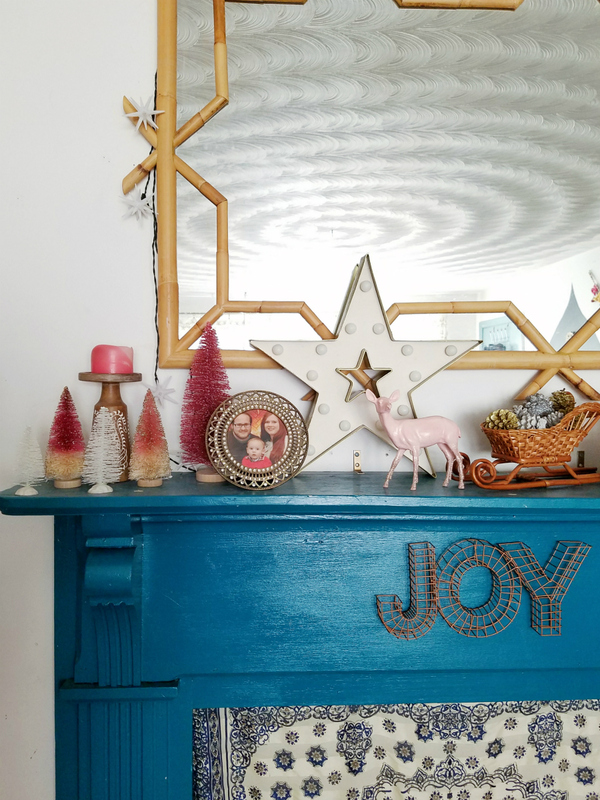 Beside the mantel is the tree and it's completely different than anything I've curated before which was quite the task given I didn't buy a single thing for it this year. A chunk of my prelit tree went dead this year and it was so much trouble finding the burnt out bulb that I just ripped all of the lights out. 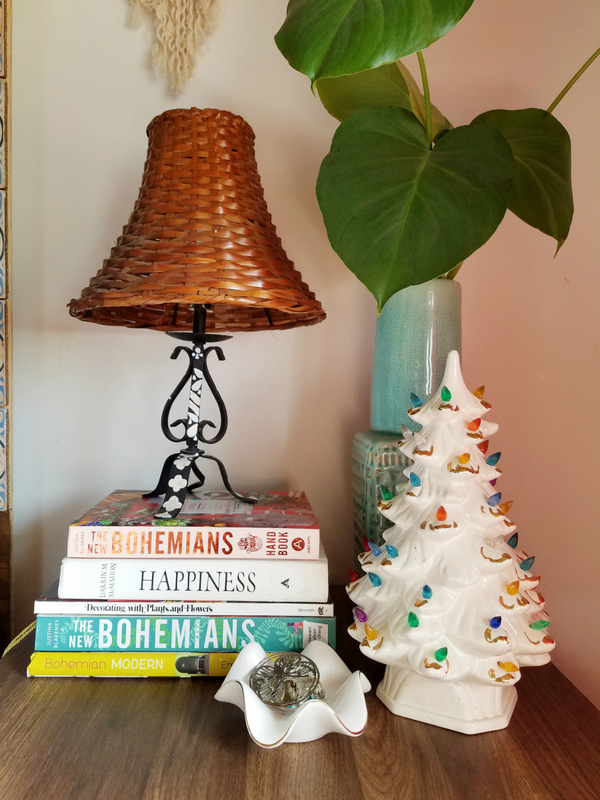 I didn't have any other white light strands though and I never buy my holiday decor at full price so I pulled out all my bins and found a few boxes of colored lights. It's a silly thing to be nervous about but I hesitated. I've never done colored lights before. But I am in love! They're soft, not neon, so they just have a happy little glow about them. I gave thanks to past Corinna for looking out for future Corinna on that one. 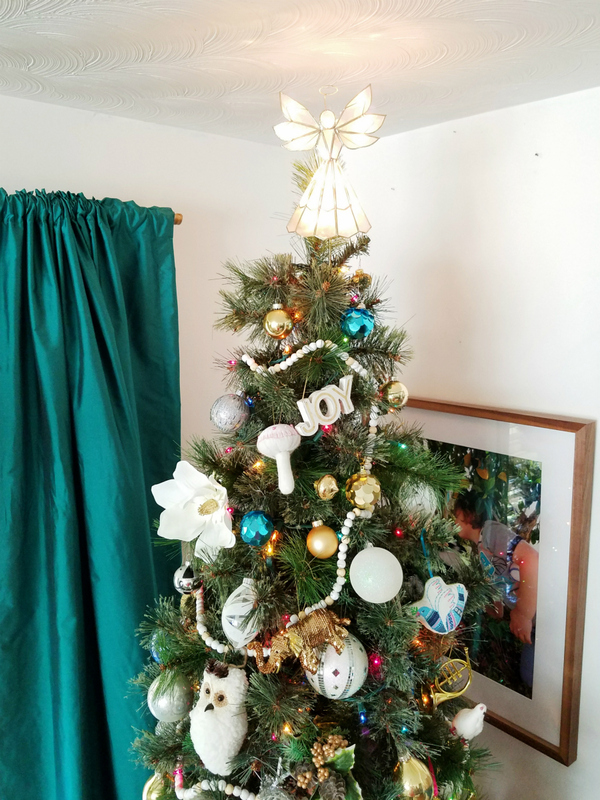 I call this tree my whimsical themed tree. 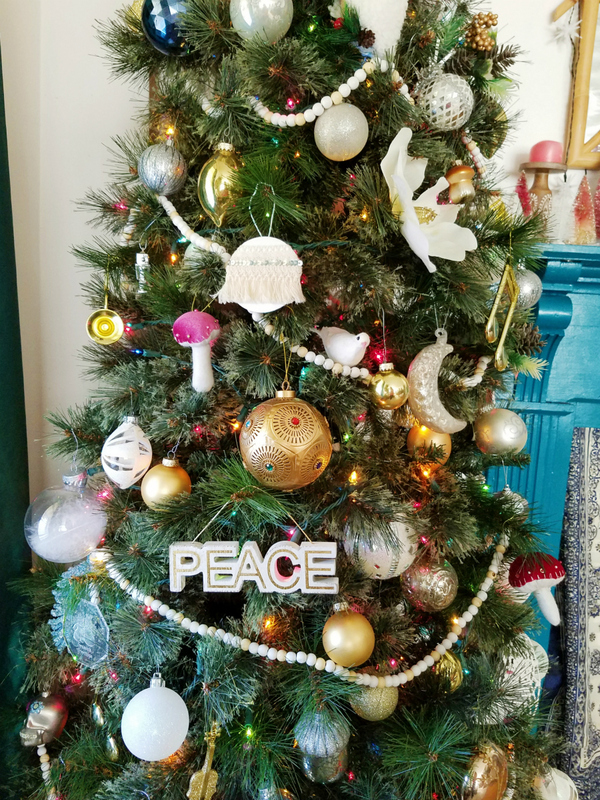 With the pops of magnolia flowers and birds paired with musical instruments, acorns, robots and mushrooms, there is just so much to look over on this tree. I really enjoy getting lost in all of the little interesting details. 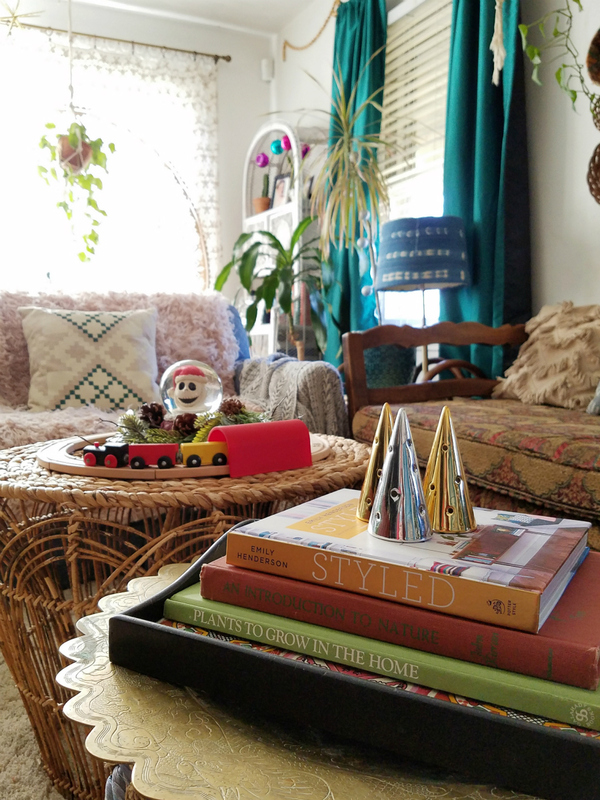 The rest of the living room has little holiday displays throughout. 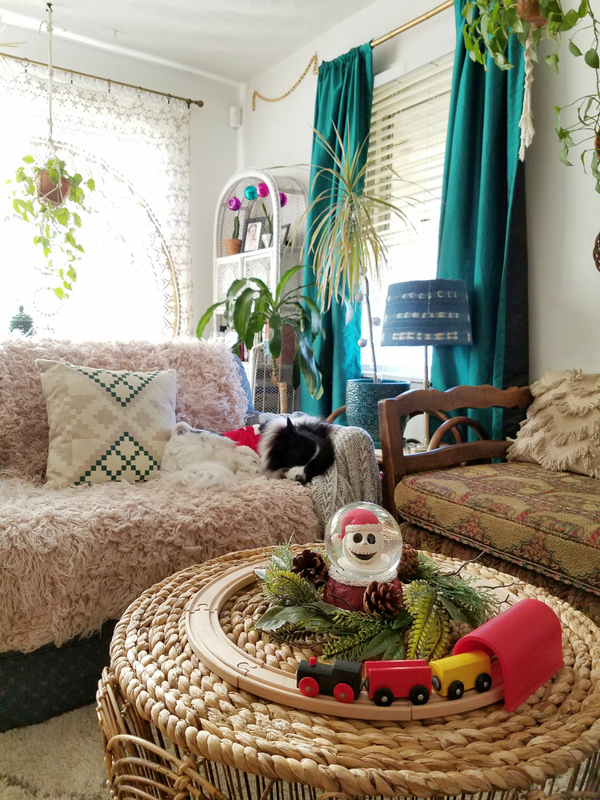 I simply took down some of my year round decor and replaced it with the holiday decor. 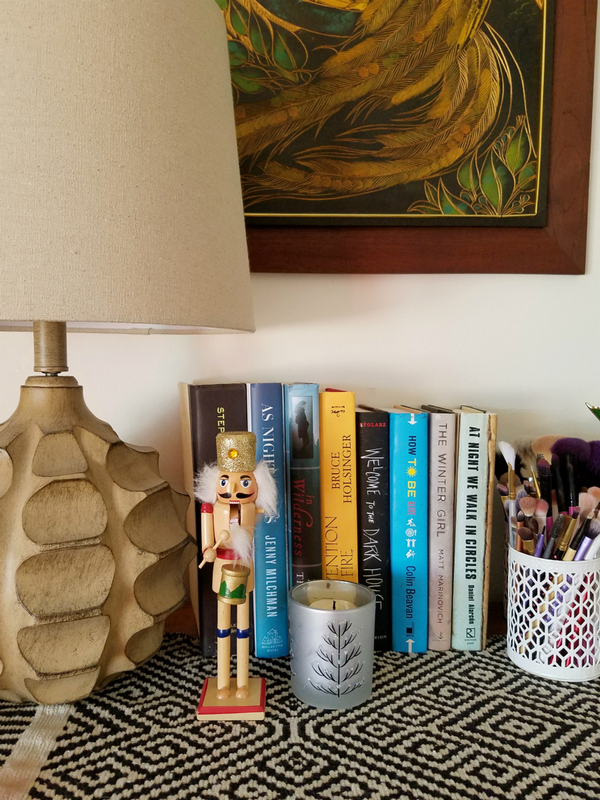 I really enjoy being surrounded with joyful little reminders of the special time of year we are in. 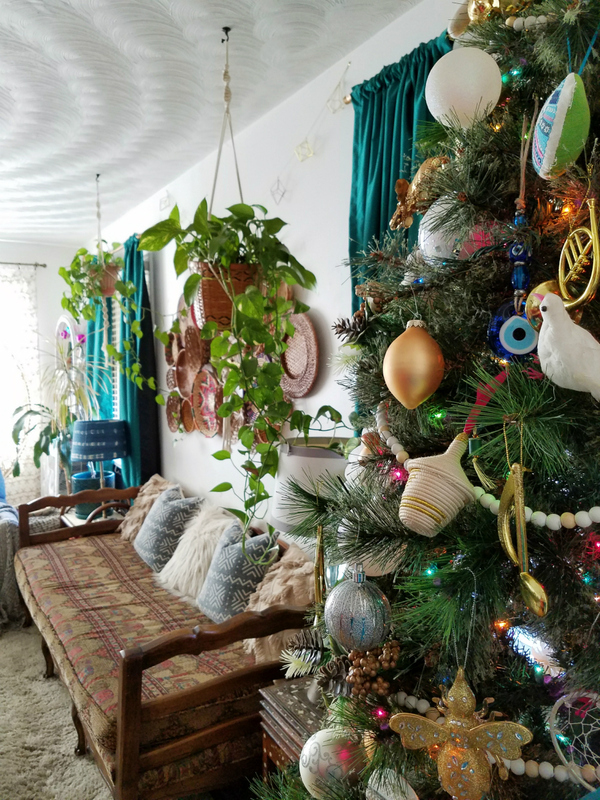 I've used ornaments, banners, wreaths, toys, snow globes, garlands, nutcrackers and tree figurines to decorate the space. For the first time in a long time, I have been slow to getting the decor up. I had so much fun decorating for Halloween. The week after though I was crashing from the high of the fun and received some personal bad news that put me in a slump. Now that everything is up, life has a bit of that magic back and it pleases my soul. I really do enjoy having the tree with colored lights in here this year. But part of me misses the white lights. Maybe I'll do a third tree next year with white lights and the colored ornaments so I can have the best of both worlds. Yes, I said three trees. But I haven't mentioned a second tree, have I? Now this tree I am super excited about. Did you know it's the 25 year anniversary of the Nightmare Before Christmas? I am a huge fan! Huge. 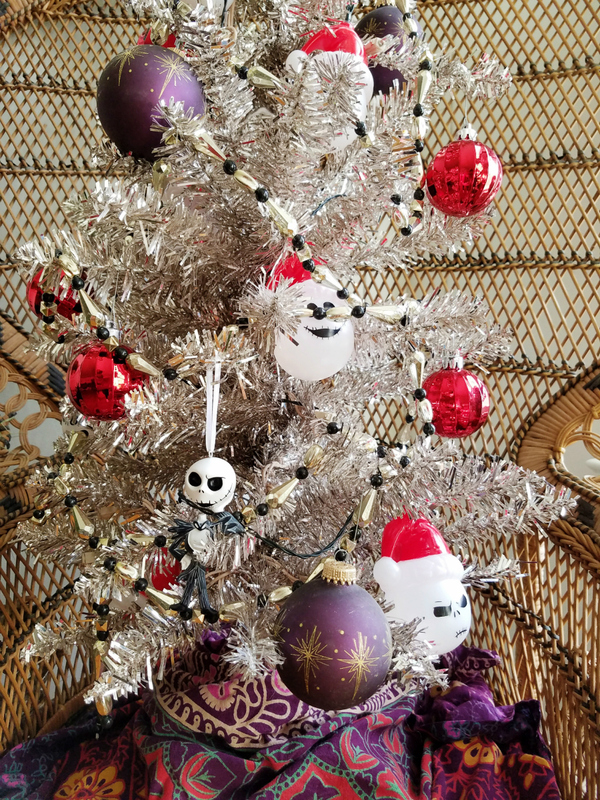 So I paid tribute to the anniversary with a Nightmare Before Christmas themed tree. It's a small 4 foot "rose gold" tree. And I put the rose gold in quotes like that because it says that it;s a rose gold tinsel tree but it is not rose gold in the slightest. But that's okay because I am still super excited with how it turned out! 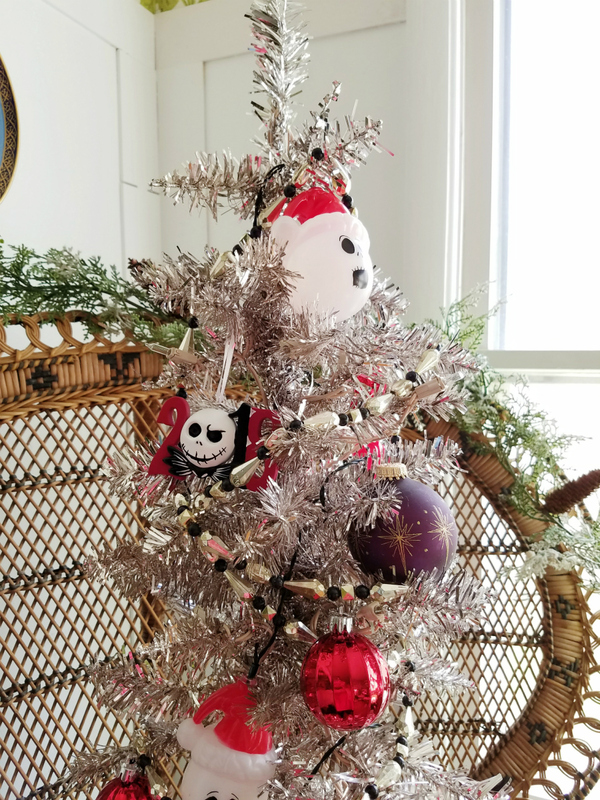 The Nightmare Before Christmas tree is in the dining room. Decor in here is pretty simple. 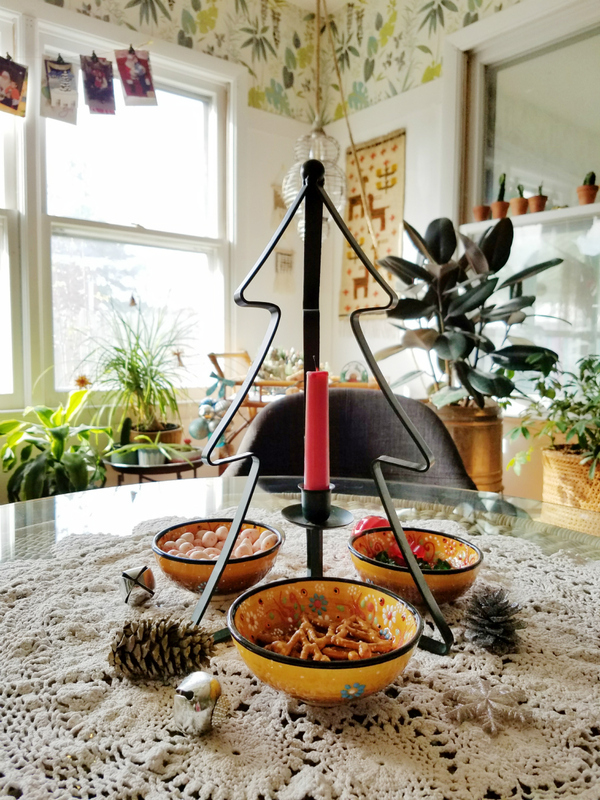 I went with a thrifted metal tree taper candle holder on the table with three hand painted bowls from Turkey gifted to me by Grand Bazaar Shopping. They hold treats to enjoy with some hot cocoa because that's one of my favorite things to do this time of year! Over the window I have some twine with pins for Christmas photos and cards. I keep the cards we are gifted each year and put them up at the beginning of the season and add to it as we receive more each year. And on the bar cart I've set up all of my vintage a newer Christmas village sets. 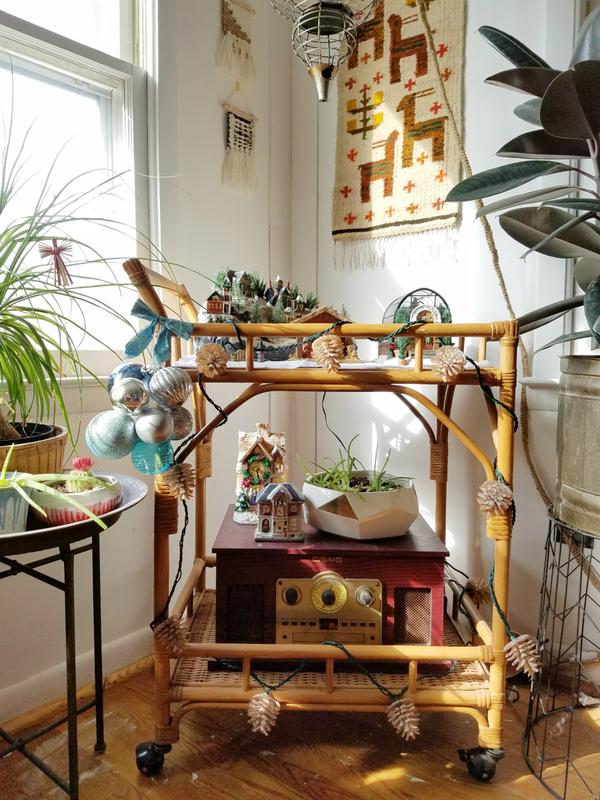 The big fiber optic one is my favorite because my grandmother gave it to me but my thrifted greenhouse is a really close second! 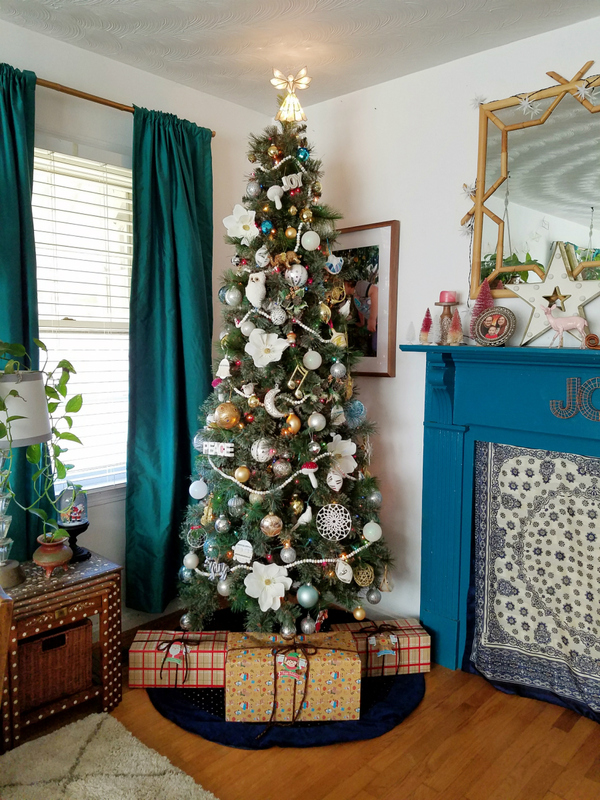 The rest of the room is filled with cheery little pops of color with the help of extra ornaments that did not get used on the tree this year. I really enjoy sipping on a mug of hot cocoa in this room. 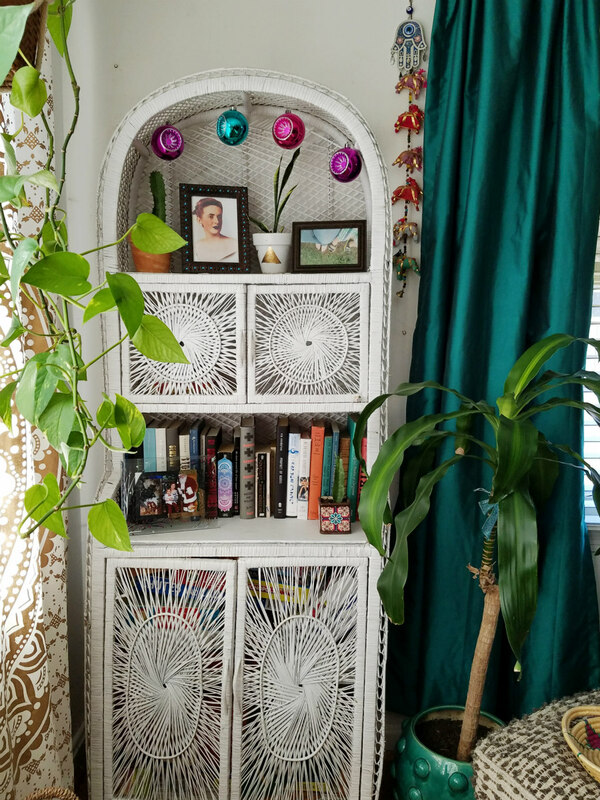 Especially since so many of my houseplants hang out in here to keep happy during these darker days. Okay, I feel like I've been keeping you here forever! 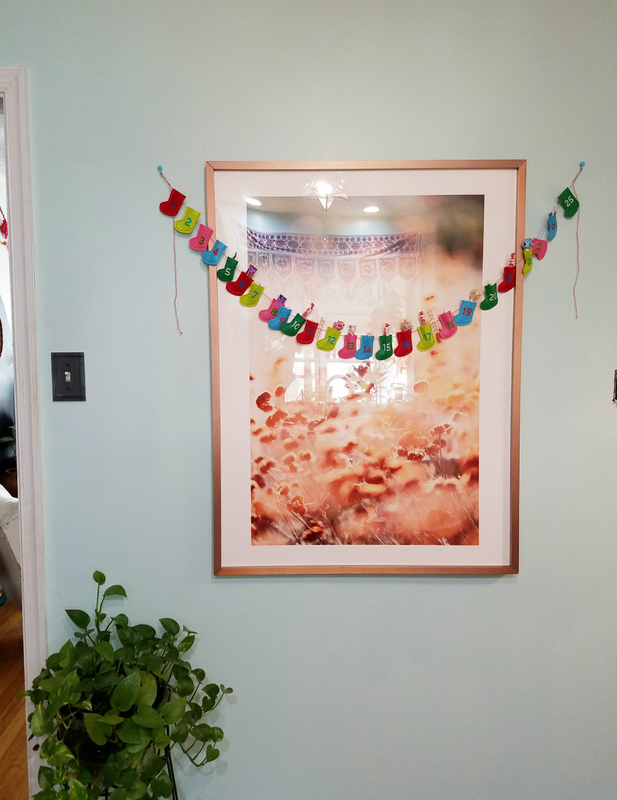 Let me show you the advent banner in the kitchen real quick since it's the only decor in that room and then I'll show you the simple decor I've decorated my bedroom with. Each of the mini stockings is filled with a small piece of candy to help my child see how close we are getting to Christmas. I've made the mistake of teasing him with a couple of gifts already wrapped under the tree so having the visual is helping a lot with his patience! And finally, my bedroom. 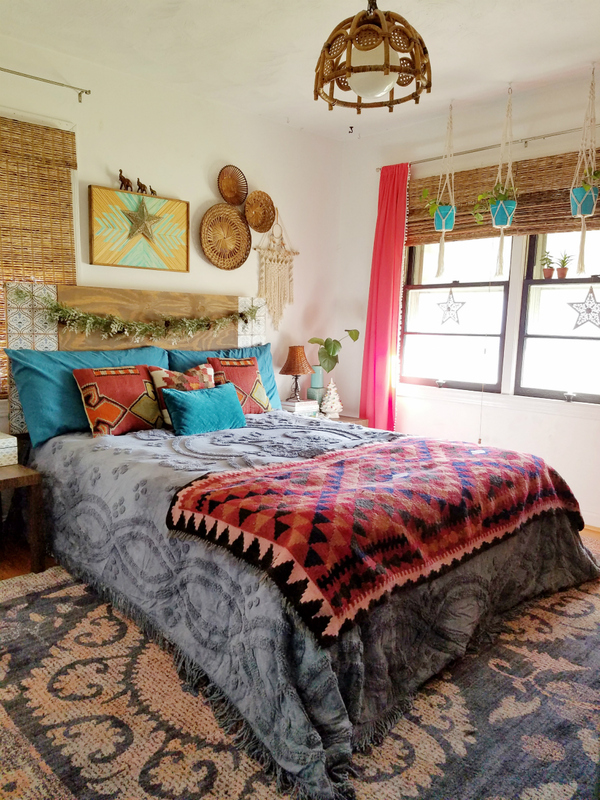 I went with the general moodiness and vibe we've been experiencing so far this season and went darker in here with the bedding. 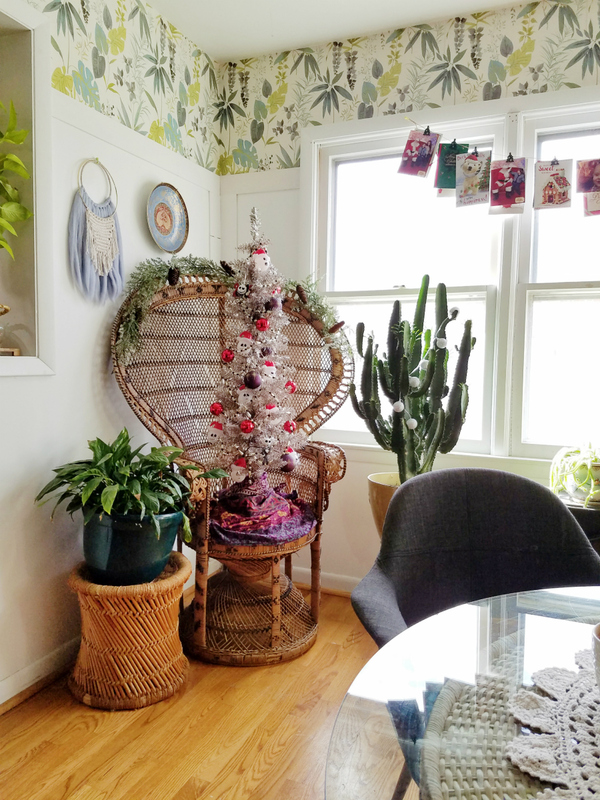 A couple pieces of Christmas decor and garland makes the space festive without a lot of work. The next stop on the list of tours is Monica of Monica Wants It. You simply must go visit her! 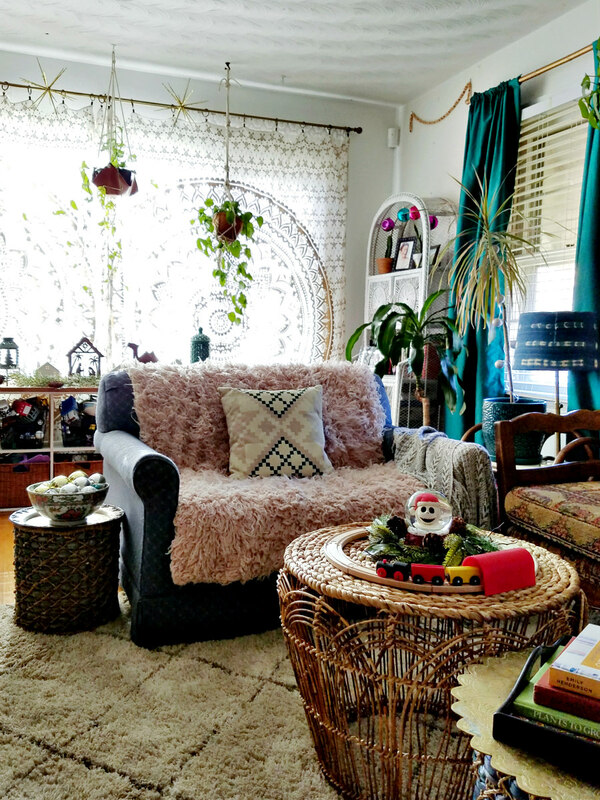 Her gorgeous decorating is always impressive and inspiring. 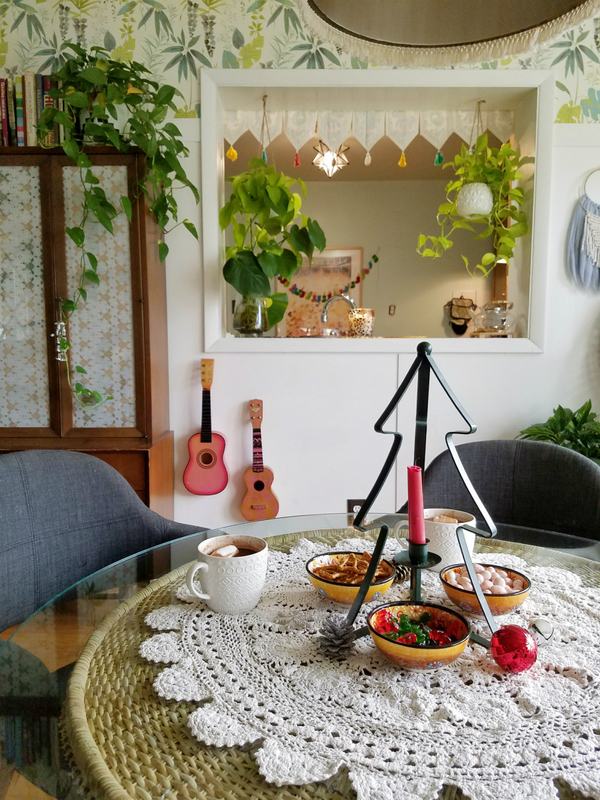 Check out her Eclectic Dining Room here. Hey friend! Looking good! 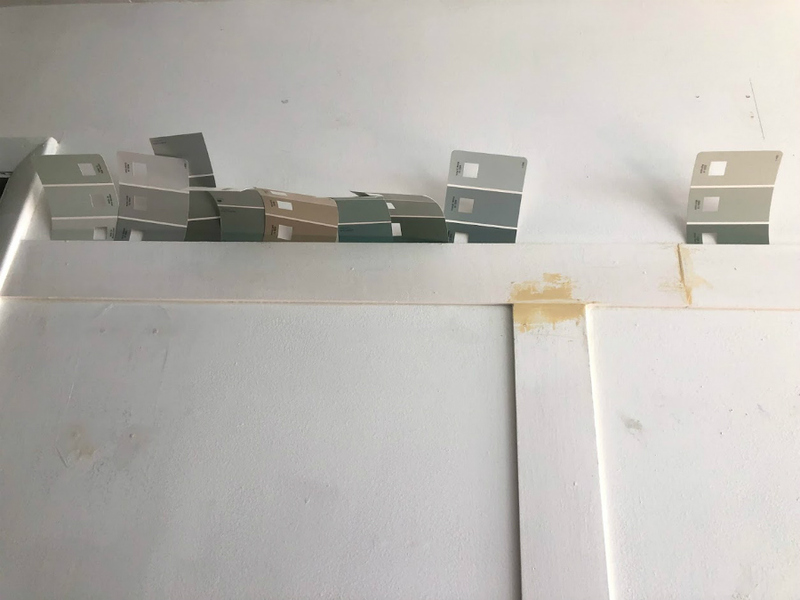 I love the little touches throughout your house. 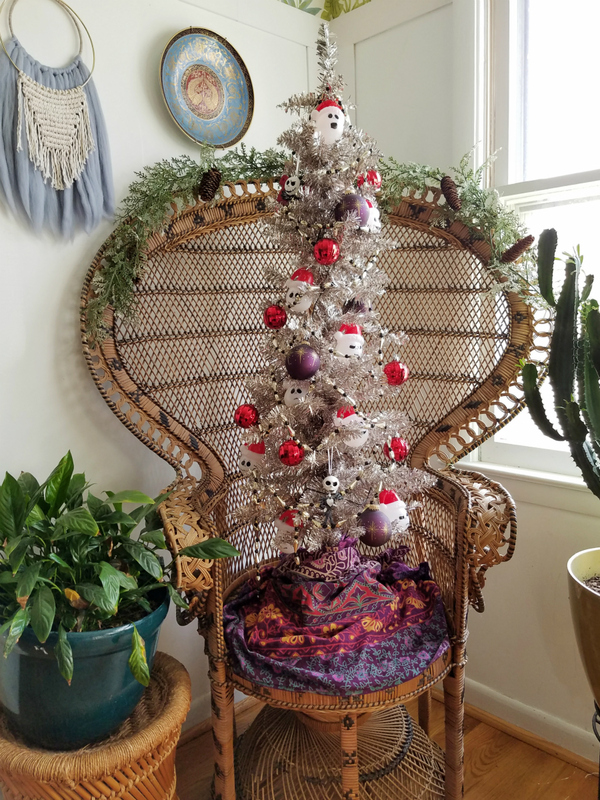 And that tree in the peacock chair!!! 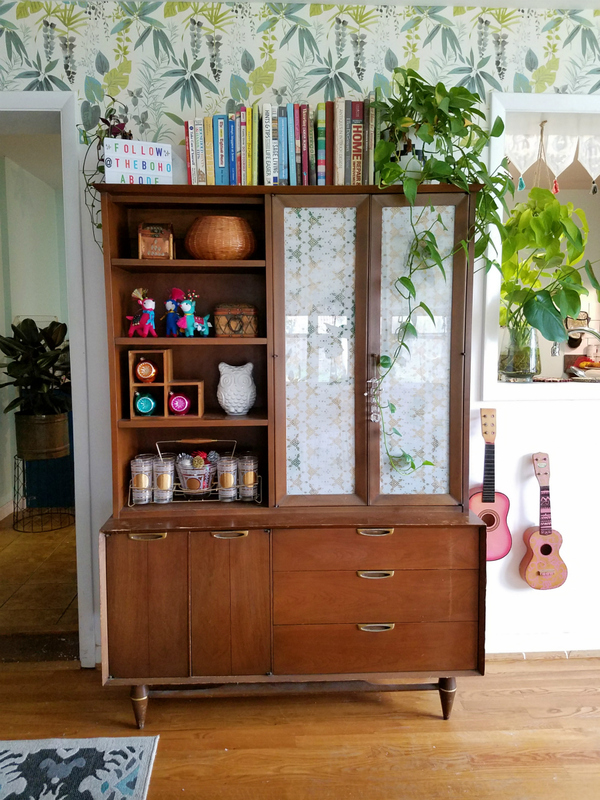 So many fun details Corinna! It's so cozy and beautiful. I can't believe The Nightmare Before Christmas has been out for 25 years. I remember when it was first released! lol LOVE the Christmas greenhouse and your bedding is GORGEOUS! Merry Christmas beautiful! 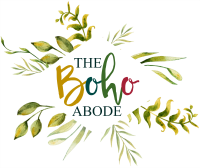 You my friend are the queen of boho! I love your tour and how true to your style it is. Also, I love that picture of you at the door...you are gorgeous! Merry Christmas and Happy Holidays!